You can add as many tests as needed, depending on how many things you want to test for. 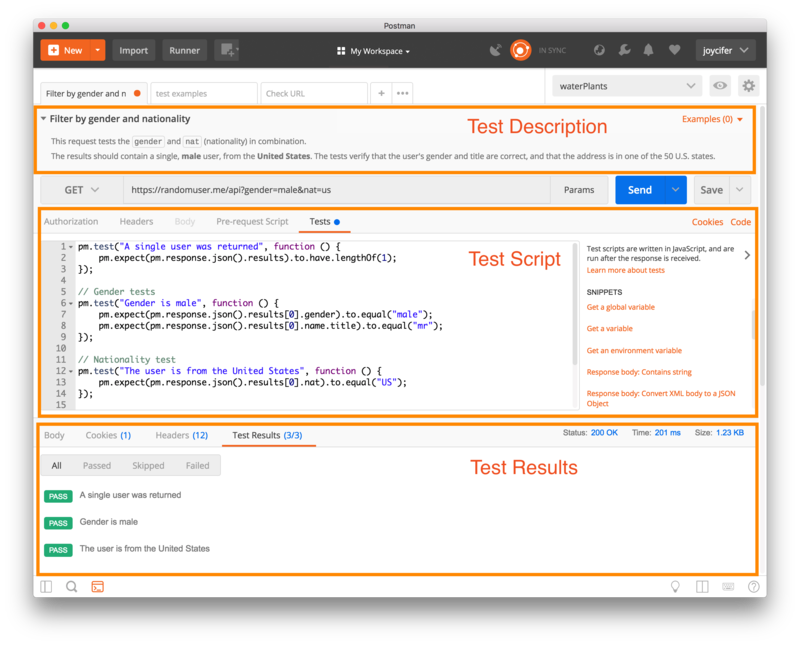 Check out some examples of Postman tests. Tests are saved as part of collection requests. This is perfect for both back-end and front-end developers to ensure that everything is working properly with the API. No more squinting through code trying to figure out what went wrong! 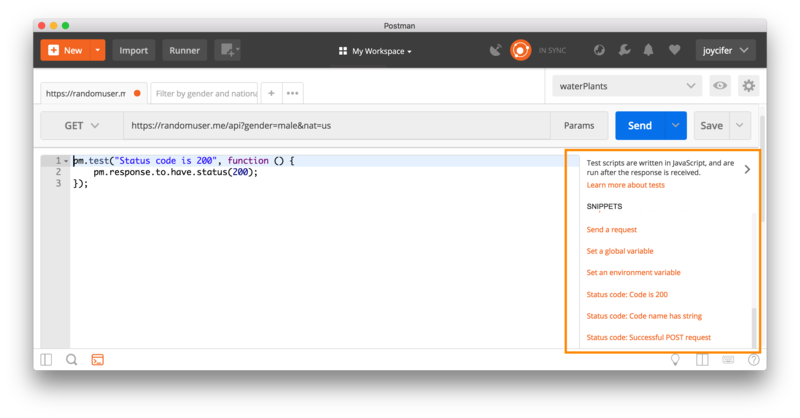 Postman tests run in a sandboxed environment, which is separate from the execution environment of the app. To check what is available in the test script sandbox, take a look at the Sandbox documentation. While there are very few things to remember while writing tests, Postman tries to make the process easier by listing commonly used snippets next to the editor. You can select the snippet you want to add and the appropriate code will be added to the test editor. This is a great way to quickly build test cases. 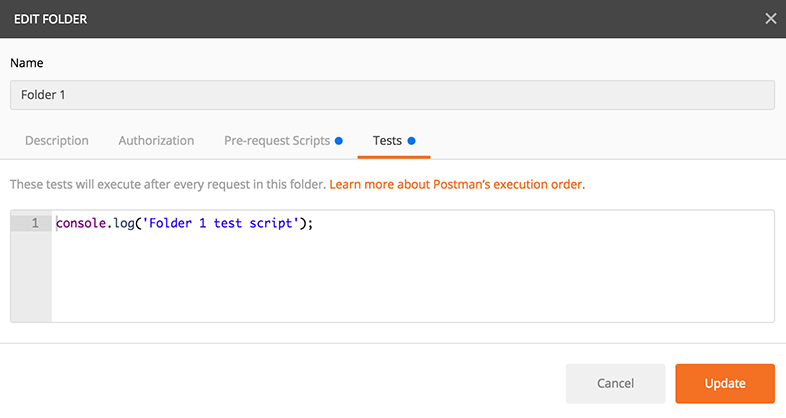 Postman runs tests every time you run a request. Of course, you can choose to not look at the test results! Results are displayed in a Tests tab under the response viewer. The tab header shows how many tests passed, and the test results are listed here. If the test evaluates to true, the test passed. Users can add test scripts to a collection, a folder, or a single request within a collection. A test script associated with a collection will run after every request in the collection. A test script associated with a folder will run after every request in the folder. This allows you to reuse commonly executed tests after every request. Collection and folder scripts can be updated in the collection or folder details respectively. Click on the ellipsis (...) next to the collection or folder name, and select “Edit” to open the modal. Select the Tests tab to add and update the scripts. You can also add collection scripts when initially creating the collection. Read more about the execution order of scripts.